ISELIN, NEW JERSEY, USA, July 11, 2018 /EINPresswire.com/ -- William and Anthony are chairing SMi's Superbugs & Superdrugs USA Conference and encourage all involved in AMR to join experts from multiple disciplines, in the field of infectious disease representing research, regulatory, funding, diagnostics and academia, at this event in New Jersey on November 12 -13, 2018. 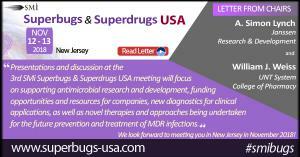 Superbugs & Superdrugs USA Conference will become a platform where participants will get exposure to presentations and discussions focusing on supporting antimicrobial research and development, funding opportunities and resources for companies, new diagnostics for clinical applications, as well as novel therapies and approaches being undertaken for the future prevention and treatment of MDR infections. In the last decade we have witnessed a dramatic increase in both the proportion and absolute number of bacterial pathogens exhibiting multidrug resistance to current antibacterial agents. Organizations such as the US Centers for Disease Control and Prevention (CDC), the European Centre for Disease Prevention and Control (ECDC) and the World Health Organization (WHO) are considering infections caused by multi-drug resistant (MDR) bacteria as an emergent global disease and a major public health problem. This ‘antibiotic resistance crisis’ has been compounded by a lagging in investments in antibiotic discovery and development programs in recent years, particularly as made by large pharmaceutical companies. The emergence of MDR resistant microorganisms, either by mutation or the acquisition of mobile genetic elements carrying resistance genes, is driven through inappropriate antibiotic use but also likely takes place irrespective of exposure to antimicrobial agents. Increasing collaboration among concerned stakeholders to establish policies, initiatives, and investments in new agents to battle the antibiotic resistance crisis is promising. However, while recently approved antibiotic agents will likely help stem this crisis, novel approaches to the prevention and treatment of MDR infections are needed to ensure a viable antimicrobial armamentarium for the future. The 3rd SMI USA Superbugs & Superdrugs meeting will bring together expertise from individuals in multiple disciplines in the field of infectious disease representing research, regulatory, funding, diagnostics and academia. We look forward to meeting you in New Jersey in November 2018!